Objective To identify, critically appraise, synthesise and present the available evidence on healthcare professionals’ perceptions of the facilitators and barriers to implementing electronic prescribing, dispensing and/or administration of medicines in the hospital setting. Methods A systematic search of studies focusing on healthcare professionals’ perceptions of technologies for prescribing, dispensing and administering medicines in the hospital setting was performed using MEDLINE, Cumulative Index to Nursing and Allied Health, International Pharmaceutical Abstracts, PsycARTICLES, PsycINFO, Cochrane Database of Systematic Reviews and Centre for Reviews and Dissemination. Grey literature inclusive of manual searching of core journals, relevant conference abstracts and online theses were also searched. Independent duplicate screening of titles, abstracts and full texts was performed by the authors. Data extraction and quality assessment were undertaken using standardised tools, followed by narrative synthesis. Key findings Five papers were included in the systematic review after screening 2566 titles. Reasons for exclusion were duplicate publication; non-hospital setting; a lack of investigation of healthcare professionals’ perceptions and a lack of focus on implementation processes or systems specific to electronic prescribing, dispensing or administration of medicines. Studies were conducted in the USA, Sweden and Australia. All studies used qualitative interview methods. Healthcare professionals perceived systems improved patient safety and provided better access to patients’ drug histories and that team leadership and equipment availability and reliability were essential for successful implementation. Key barriers included hardware and network problems; altered work practices such as time pressure on using the system and remote ordering as a potential risk for errors; and weakened interpersonal communication between healthcare professionals and with patients. Conclusions Few studies were identified on healthcare professionals’ perceptions of the facilitators and barriers to system implementation in hospitals. Key facilitators included a perception of increased patient safety and better access to patients’ drug history while key barriers involved technical problems, changes to routine work practices and weakened interpersonal communication. Investigating this area further will assist in improving patient safety and reducing medication costs by informing and strengthening implementation strategies. Despite these advances in technology, many hospitals currently rely on a traditional manual medicines management system that can be both inefficient and ineffective. Written prescribing errors most frequently occur, followed by administration errors, followed by dispensing errors for hospital inpatients.9 Preventative strategies are required such as the effective use of eHealth in the prescribing, dispensing and administration of medicines in the hospital setting. While several systematic reviews have been published on outcomes such as the effects of electronic prescribing, dispensing or administration of medicines on medication errors and cost, no systematic review and few primary studies have been conducted on healthcare professionals’ perceptions of system implementation in a hospital setting.10 ,11 ,19 ,20 Due to the importance of assisting implementers with successful implementation at a micro, meso and macro level,2 the objective of this systematic review was to identify, critically appraise, synthesise and present the available evidence on healthcare professionals’ perceptions of the facilitators and barriers to implementing electronic prescribing, dispensing and/or administration of medicines in the hospital setting. Studies of doctors, nurses, pharmacists and other allied healthcare professionals involved in prescribing, dispensing and/or administration of medicines were included in the review. Electronic prescribing, dispensing and/or administration of medicines was the main focus of this review. This phenomenon of interest excluded other eHealth systems such as electronic medical records, unique patient identifiers, clinical decision support systems and electronic discharge prescriptions. Studies that did not focus on implementation, for example, clinical and fiscal outcomes and effects on patients and resources, were also excluded. Any hospital setting was included. Only full-text papers published in English were included in the review. Summaries of the literature for the purpose of information or commentary and editorial discussions were excluded. MEDLINE, Cumulative Index to Nursing and Allied Health, International Pharmaceutical Abstracts and PsycARTICLES (via EBSCOhost), PsycINFO, Cochrane Database of Systematic Reviews and CRD were searched. An example of the search strategy used in MEDLINE is provided in table 1. Grey literature in the form of manual searching of journals, accessing conference abstracts either by attendance or online, and online theses were also searched. The bibliographies of relevant full-text literature were screened. No date limitation was applied to the search, which was conducted until August 2013. A wide variety of search terms were combined within each of the three main concepts: healthcare professionals; electronic prescribing, dispensing or administration of medicines; and hospital setting (table 1). All identified articles were imported into ‘Refworks’ and thereafter exported to Microsoft Excel for title/abstract screening. To enhance reliability, 10% of the study titles and abstracts were reviewed by the authors independently for relevance. Full texts were then sought for all studies appearing to meet the inclusion criteria, and a final selection of papers for data extraction and quality assessment was made independently by the authors. 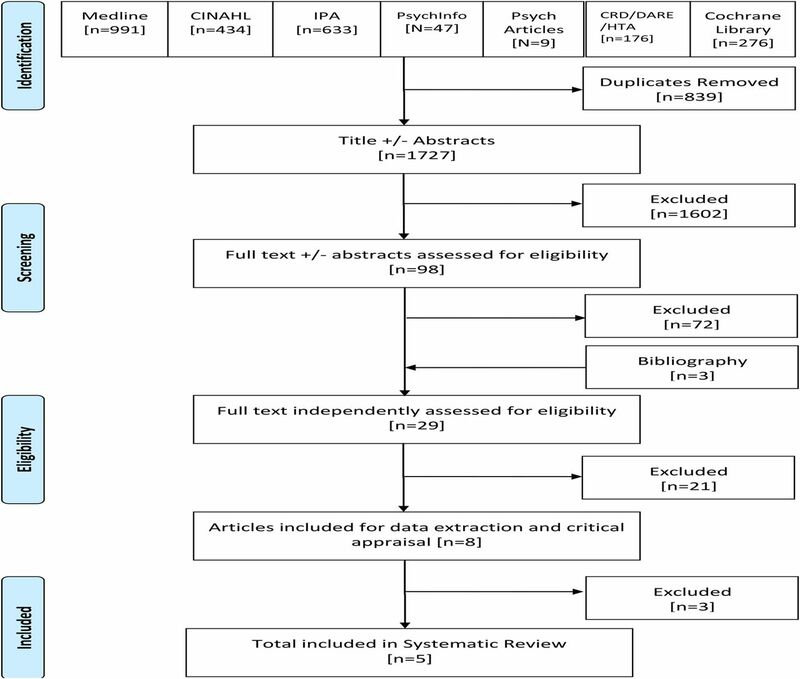 Five studies were included in the systematic review from a potential 2566 titles that were initially screened (figure 1). Reasons for exclusion were due to inappropriate setting, inappropriate systems, lack of focus on healthcare professionals’ perceptions or mainly due to the retrieval of studies not centred on implementation but focused on outcomes. Out of the final eight studies included in quality assessment and data extraction, three were excluded thereafter due to poor methodological approaches post independent analysis by the primary researcher and two members of the review team (table 2). Three studies were identified from database searches and a further two studies were identified from the bibliographies of the studies included for full text/abstract screening. Manual searching of key journals did not provide additional literature for inclusion. Studies were mainly based in the USA, one in Sweden and one in Australia. The Preferred Reporting Items for Systematic Reviews and Meta-analyses (PRISMA) flow diagram of literature search. CINAHL, Cumulative Index to Nursing and Allied Health; CRD, Centre for Reviews and Dissemination; DARE, Database of Abstracts of Reviews of Effects; HTA, Health Technology Assessment Database; IPA, International Pharmaceutical Abstracts. Table 2 provides a summary of the study authors, year and country of origin; the types of participants; the types of systems; context; the aim of the studies; the research methods used; and the main findings from each of the included studies. All of the studies were explicit in their aims/objectives and rationale for study method (table 3). Limitations for the design were stated in four of the five studies. The research design was appropriate to address the aims of the research in three of the studies and partially in two studies. The rationale for selecting the study population was provided in three studies while one study did not offer this information and it was not clear in another. All studies stated the recruitment strategy. Four of the studies partially described ethical considerations while it was unclear in one study. Measures to enhance reliability of the data collection tool were outlined in four studies while it remained unclear in one paper. Data analysis was performed independently in three studies, solo in one study and was not stated in another paper. Limitations of the findings were discussed in three papers and conclusions were made relevant to the research question in four studies. A clear statement of findings was evident in two studies and partially in three studies. No bias or conflict of interest was likely in any study included in the systematic review. Nine main facilitators and 12 main barriers were identified from the included studies by nursing, medical and pharmacy staff to system implementation in the hospital setting (table 4). Using a narrative approach, all studies were combined for the synthesis. While more barriers than facilitators were identified, two studies focused solely on barriers with the remainder focusing on both barriers and facilitators. Healthcare professionals faced numerous challenges with various system implementations. Twelve main themes emerged when synthesising findings from a combination of all studies relating to the various barriers perceived by healthcare professionals towards system implementation in the hospital setting (table 4). These themes included technical problems; altered work practices; weakened inter-personal communication; practice-related medication errors; poor access to computers; logistics of education and training; unsupportive management teams; implementation roll-out; cost; circumvention of the system; security; and de-skilling. Several themes that were viewed as facilitators by healthcare professionals were also perceived as barriers to system implementation inclusive of interpersonal communication, patient safety, time availability, information access and staff training. Healthcare professionals’ perceived systems improved patient safety and enhanced access to patients’ drug histories and that team leadership and equipment availability and reliability were essential for successful implementation. Key barriers included hardware and network problems, changes to routine work practices, weakened interpersonal communication between healthcare professionals and with patients, and resistance to technology and training. Differences in study settings, countries and sampling may explain variations in identified facilitators and barriers. Further qualitative studies may best identify the nature of these changes. In a descriptive questionnaire-based study by Cresswell and colleagues that primarily investigated the current implementation status of ePrescribing systems in National Health Service hospitals, lessons learnt from early implementation included the need for increased guidance in relation to implementation strategies, system choice and top-level management support to adequately resource adoption.35 Parallel to findings in this systematic review, desired functionalities included integration with existing local systems and a more sophisticated decision support. The researchers also found that unrealistic expectations surrounding the capabilities of systems may inadvertently result in disappointment and disillusioned stakeholders. The elucidation and understanding of healthcare professionals’ perceptions of the positivity and concerns of system implementation can assist in informing, strengthening and sustaining implementation strategies. Effectiveness, ability to work with existing practices and appropriate management of systems were major constructs identified in this systematic review. As further identified in this review, it is important that implementers systematically plan for all aspects of the implementation process inclusive of staff training, support, work flow changes and communication. Success requires a high level of collaboration and negotiation across departments and between IT, end users and management, as well as a requirement to provide reassurance that staff will be supported. All types of research methods were searched with papers not in English excluded. A wide range of databases were used to search the literature. Manual searching of core journals, conference proceedings and online theses led to no studies considered for potential inclusion that raises issues around adoption of such methods in the future. No study was identified for inclusion that explored the perceptions of pharmacy staff on the barriers and facilitators towards the implementation of electronic systems for dispensing medicines in the pharmacy department. A limitation of the included qualitative studies related to a general lack of robustness with one paper assessed as poor quality, one as average quality and three as good quality. However, three researchers working independently added to the rigour of the literature inclusion and exclusion decisions. In addition, this strengthened the review process in terms of data extraction and quality rating. Structured data extraction and quality assessment forms ensured that no relevant data were missed and that important elements around study quality were properly scrutinised. A narrative synthesis of findings allowed results to be tabulated and categorised in a comprehensive manner. A very limited number of studies were identified on healthcare professionals’ perceptions of the facilitators and barriers to system implementation in hospitals. From the findings of this review, it is evident that successful system implementation will largely depend on effective leadership, the availability of high-quality systems and the development of appropriate skills and staff training for end users. Implementation planning is inherently contextual and the likelihood of successful adoption is increased if end users are educated on the necessary work changes involved. Any concerns or emotions expressed should be addressed by system designers and managers right from the onset and time should be allocated to adjust to the new ways of working. An important determinant of successful adoption is that end users are well informed of the potential benefits of the system for their own work practice. Further qualitative work on the perceived facilitators and barriers to system implementation is necessary in order to provide important information on successful system implementation for policymakers and healthcare organisations in order to increase patient safety and reduce medication costs. The authors thank Professor Derek Stewart, Dr Vibhu Paudyal and Dr Pawan Rajpal. World Health Organisation. Global Observatory for eHealth. 2011 (accessed 10 Jan 2015). Health Service Executive. eHealth Strategy for Ireland. 2013. http://www.hse.ie/eng/about/Who/ICTOCIO/ehealthstrategy.pdf (accessed 10 Jan 2015). NHS Connecting for Health Electronic prescribing in hospitals: challenges and lesson learned. UK: NHS Connection for Health 2009.
. Safeguards for Using and designing automated dispensing cabinets. Pharm and Therap 2012;37:490–530.
. Examining the role of new technology in pharmacy: now and in the future. Supplements 2014. http://www.pharmaceutical-journal.com/publications/supplements/focus-community-pharmacy/examining-the-role-of-new-technology-in-pharmacy-now-and-in-the-future/11134174.article (accessed 11 Jan 2015).
. A collaborative study of medication safety in four Irish hospitals. Irish Pharm J 2007;85:68–73.
. Information technology implementation in a rural hospital: a cautionary tale. J Healthc Manag 2009;54:337–47.
. Barcode medication administration: lessons learned from an intensive care unit implementation. Adv Patient Saf 2005;3:437–52.
. Information technology. Implementing computerized physician order management at a community hospital. Jt Comm J Qual Patient Saf 2008;34:74–84.
. Prioritizing the risk factors influencing the success of clinical information system projects: a Delphi study in Canada. Methods Inf Med 2008;47:251–9.
. The impact of eHealth on the quality and safety of health care: a systematic overview. PLOS Med 2011;8:e1000387. doi:10.1371/journal.pmed.1000387 (accessed 11 Jan 2015). The Cochrane Collaboration. Cochrane Handbook for Systematic Reviews of Interventions Version 5.1.0 2011. http://www.cochrane-handbook.org (accessed 10 Jan 2015). Centre for Review and Dissemination. Systematic reviews: CRD's guidance for undertaking reviews in health care, 2009. http://www.york.ac.uk/inst/crd/index_guidance.htm (accessed 10 Jan 2015).
. Healthcare professionals’ perceptions of the facilitators and barriers to implementing electronic prescribing, dispensing and administration of medicines in hospitals: a systematic review. 2013. http://www.crd.york.ac.uk/PROSPERO/display_record.asp?ID=CRD42013004427#.VLD-FtKsWSo (accessed 10 Jan 2015).
. The nuts and bolts of PROSPERO: an international prospective register of systematic reviews. Syst Rev 2012;1:2 http://www.systematicreviewsjournal.com/content/1/1/2 (accessed 12 Jan 2015). The Joanna Briggs Institute. Joanna Briggs Institute Reviewers’ Manual 2011. http://joannabriggs.org/assets/docs/sumari/ReviewersManual-2011.pdf (accessed 10 Jan 2015).
. Critical Appraisal Skills Programme [CASP] 2013. http://www.casp-uk.net/ (accessed 10 Jan 2015).
. Guidance on the conduct of narrative synthesis in systematic reviews. 2006: Final Report. Swindon: ESRC Methods Programme.
. Narrative synthesis in systematic reviews. ESRC Methods Briefings;2003:22.
. End-user perceptions of a computerized medication system: is there resistance to change? J Health Hum Serv Adm 2004;27:34–55.
. What determines successful implementation of inpatient information technology systems? Am J Manag Care 2012;18: 157–62. Correction notice This paper has been amended since it was published Online First. Dr Pawan Rajpal was wrongly credited with authorship and has now been moved into the Acknowledgements section. Diana Hogan-Murphy was also incorrectly described as Professor in the correspondence address.